McDonald’s and Wendy’s have both recently announced that they’re asking their pork suppliers to draw up plans to phase our gestation crates. Maybe it’s the contrarian in me, but I have to say a positive word about gestation crates. For the uninitiated, gestation crates are metal cages in which pregnant sows live while they await the birth of their litters. Since it’s to the farmer’s advantage to breed his sows as often as possible, the sows end up spending the majority of their mature lives in these cages, which are typically not large enough for them to turn around, and sometimes don’t even let them lie down without difficulty. 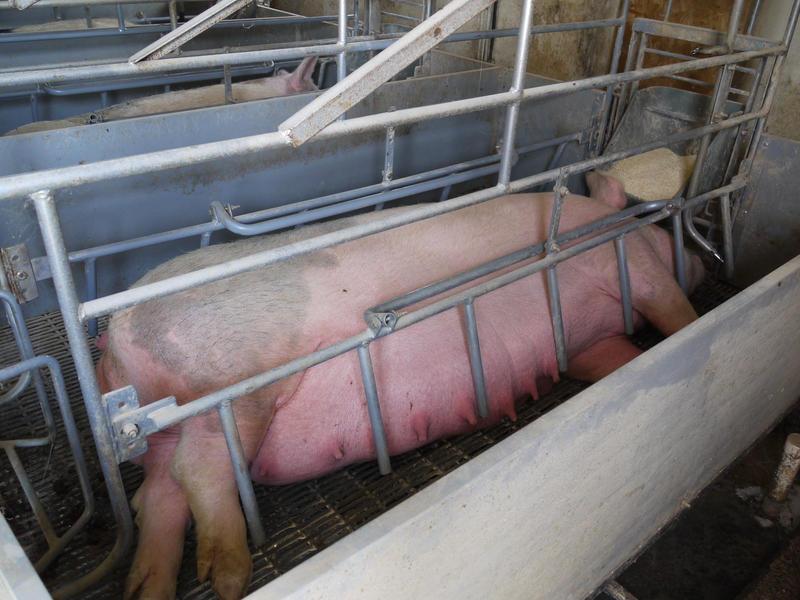 Some gestation crates, however, are big enough for sows to recline and turn around; here is a picture of one from Fischer Family Farms in Waseca, Minnesota that allows the farmer to pull the sidebars down so that the sows can turn around. I’m not in favor of keeping sows in these crates for most of their adult lives, even if the crates are a little bigger. Aside from the obvious movement problems, the crates don’t allow sows to build nests for their litters, which is one of their strongest natural drives. However, the most common alternative to gestation crates is to group-house pregnant sows, which means they’re all in a barn together. Unfortunately, sows are aggressive animals, especially when pregnant, so that leads to a lot of fighting and to the weaker sows being repeatedly attacked and prevented from eating their fair share of the food. Lest you think a little scuffle now and then isn’t a big deal, consider this: dominant sows in line for food will bite the vulvas of the sows in front of them. Doesn’t sound so great. I discussed this welfare dilemma with Wayne Martin, Swine Welfare Specialist at the University of Minnesota Extension. He had a rather interesting solution: keep the sows in crates for the first three to four weeks of their pregnancies, when hormones are running highest and they are most aggressive. Then keep them in group housing for the remaining three to four months of their pregnancies. Is it perfect? No. But it’s a compromise that the industry and animal welfare groups might consider before going whole hog for a “solution” that could make sows’ lives worse. Big companies such as McDonald’s, Wendy’s, and Burger King, can readily afford for animals to be provided with less inhumane conditions. However, there is no humane way to commercially produce meat (or milk or eggs, for that matter) and the real solution is for people to instead eat a vegan diet. It’s also better for human health and the environment. Mary, Thanks for your comment and for providing the link to the article. In my view, while indeed there are ways to mitigate aggression, the welfare problem is far from solved. I’m still not convinced that gestation crates for short periods of time are out of the question.